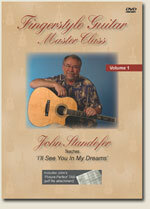 This Video/Tab offering is the first in a series of Fingerstyle Guitar Master Class videos, which are designed to provide high quality, affordable video guitar lessons for intermediate to advanced fingerstyle guitarists. These are not just 'see and do' lessons, however. Being able to play a piece well is only half of the formula for becoming an accomplished artist. The other half is learning to develop basic songs into spellbinding arrangements that thrill audiences (and reveal your unique talents). The goal of this series is to take you through the step by step process of developing a song. You will not only learn how to play the piece, but you will view the arranging process from the perspective of the arranger. When you are done you will have learned a great performance piece and, better yet, you will have gained many valuable insights into how the arrangement evolved and which techniques were used to accomplish it. We think you will appreciate the added value of this approach, especially over time as you begin to develop your own arrangements. Approximate Running Time: 45 minutes. Includes 'Picture-Perfect Tab'. Filmed in 2006 at the Chet Atkins Appreciation Society convention.